Whether you’re shopping for a new or used Kia, or looking to keep your current vehicle running smoothly, turn to Shottenkirk Kia of Quincy. Our family-owned Kia dealership proudly serves drivers with new and pre-owned Kia models, financing, parts, and service. Besides being a part of Quincy's largest and highest volume dealership group, we are dedicated to giving back to the community by supporting initiates such as the Stand With Estela Fund. Stop by our devoted Kia dealership, and you can expect to be treated like part of the family! Shopping for a new Kia is a smart move when you are in search of an affordably-priced and value-packed sedan, crossover, or SUV. 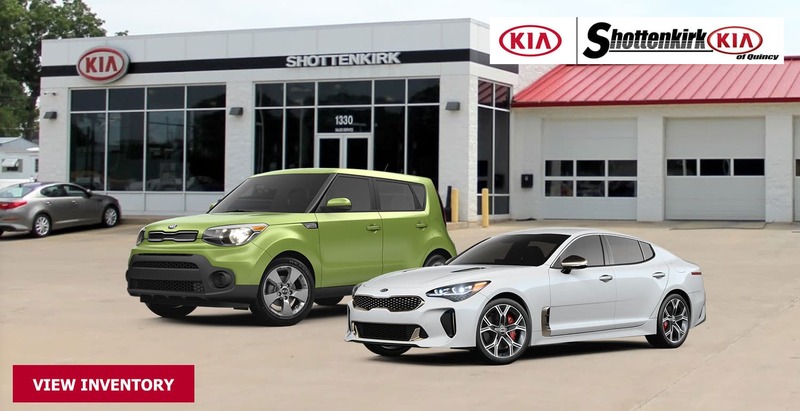 Here at Shottenkirk Kia of Quincy, you can tour and test drive the complete lineup of new Kia models for sale. From the popular Forte compact and Optima mid-size car models, to the latest Sorento and Sportage crossover SUVs; our vehicles will be sure to leave you impressed! In the market for a used vehicle? Whether you are looking for a certified pre-owned Kia model or a used sedan, SUV, or pickup truck of another make, we have a variety of vehicles available for your choosing. With our inventory of pristine, late-model used cars, you can drive a dependable ride, and at a low price! When you’re ready to bring home one of our new or used vehicles, our dedicated finance specialists will help you secure an auto loan for your upcoming Kia purchase through our online credit application. Fill out the form to get pre-qualified for car financing in no time! After purchasing a car from us, our relationship doesn’t have to end there. Come to our service center for your Kia's maintenance and repairs. Your Kia deserves top-quality maintenance services, whether it is nearly-new or an older model. With ASE Certified and Kia factory-trained technicians on-site at our service department, you can trust your auto to our professional team! We offer maintenance and repair services ranging from brake jobs, tire service, oil changes, Kia warranty repairs and so much more! Remember that Shottenkirk Kia of Quincy is also your source for genuine Kia parts and accessories near Adams County, IL and Hannibal, MO. Make an appointment with us today! Shottenkirk Kia proudly serves Quincy and Hannibal areas.